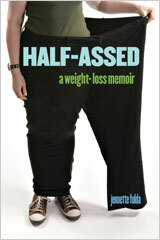 After over a year anticipation, my book, Half-Assed: A Weight-Loss Memoir , is finally coming out next month. All this foreplay and we’re finally near the climax! For anyone who is interested, I’ve been posting book news, reviews, and media mentions on the official book site. I don’t want pastaqueen.com to suddenly become all about book promotion, but I wanted a place to track everything for those of you who are curious. It’s like Las Vegas, book whoring is legal over there. I’m going to cross-post some of the big book stuff here too, like all the rest of the information in this post. I’ve finally set a date and location for my official book release party. Meet me in the garden room at The Milano Inn in Indianapolis at 3pm on Saturday, May 3rd. There will be a party, pasta, and prizes – assuming I survive the Mini-Marathon that morning. And if I do collapse at mile 12, I give you permission to have the party in memory of me. If I live, this will be one of the first places for you to get a copy of my book, personally autographed too! If I die, those autographed copies will suddenly be worth a lot more. Show up and maybe you’ll win the FiberGourmet gift basket. If you plan on attending, please RSVP at halfofme@pastaqueen.com so I can attempt to get an accurate head count. If you can’t make the party, I’m also doing a couple events in May and June in the following cities: Indianapolis, IN, Louisville, KY, Lexington, KY, and South Bend, IN. Details are here on the official book site. If you signed up for my mailing list, you already learned this information a couple days ago. I’m giving mailing list subscribers an early heads up on these sorts of things, so sign up! I’ve ordered 100 books to autograph and sell off of the official book site. As soon as they are shipped to my apartment, I will weigh them, figure out proper shipping and handling costs, and post a link on the book site to purchase them. If you’re on the mailing list, I’ll send an alert as soon as the link is live. I only have 100 copies to sell, so don’t let yours slip away! If response is good, I will order more, but it will take time to ship them from the warehouse and who wants to wait? 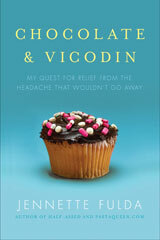 There has been great early response to the book. I’m keeping a full list of reviews here. Kirkus Reviews said it’s “A winsome, charming memoir of personal discovery.” Fellow blog-to-book authors Erin from Lose the Buddha and Wendy from Poundy had nice things to say, as well as many other people. And the American Booksellers Association named Half-Assed a Book Sense Notable book for May 2008. Some of you have also noticed that my picture has been haunting the lifestyles sections of newspapers across America. This is because my book was mentioned in an Associated Press article about weight loss memoirs. Various papers across the country have picked it up over the past couple days, choosing to print my photo with it, which is simultaneously cool and bizarre. Thanks for letting me know! If you see any other press mentions, feel free to email me about them. Whew. Self-promotion is exhausting. Enough about me, already. Back to blogging as usual on Saturday when I run my first 15K. Oh. My. God. I better start eating carbs RIGHT NOW. So cool, I can’t wait to see your book. “Run, Forrest, run!” Seriously, though, have a wonderful time… you’ll do fine, whether you make it to the end or not! Stuff yourself with spaghetti and salad! Mmm…carbs! You’re coming to KY! Yah! Carbs are the reason I run! I’ll buy an autographed book. Can’t wait! as the author of a book where I HAD TO DO ALL THE PROMO I so get what youre feeling and it *is* hard. Im happy to give you a shout out (see my friday post if you have a sec…) and am sad you wont make it to my state! VerseFameBeauty beat me to it! I was going to tell you about the front page health section appearance of Pasta Queen in the Tallahassee Democrat. I opened it up and said, “I KNOW HER!! !” (well, in blogworld…).